From Goodreads: Sometimes the hardest thing for a proud person to do is lean on others. Since her father went to prison, Mercy Taylor’s life has been crap. With forty dollars in her pocket, and a determined look on her face, Mercy decides to do something about it. She hitch-hikes her way to Myrtle Beach to start fresh. Never say it can’t get worse, because for Mercy, it does. For her, rock bottom consists of eating out of a trash can. But, once you’ve hit bottom, there’s nowhere to go but up. Jaxon Harrison left Devil Creek, West Virginia for a new start. He’d fallen in love and had given his heart to a woman who had chewed it up and spit it out. He doesn’t need that kind of heartache again. The problem is, there’s a sweet, stubborn girl who refuses to get out of his head. The moment when you get your feet firmly set on the ground, life tends to throw something else your way. What will the future hold for Mercy and Jaxon? 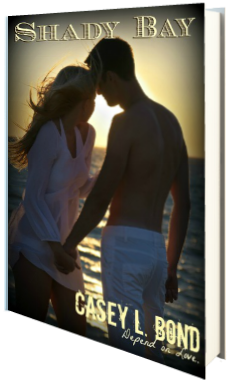 Casey L. Bond’s spring release, Shady Bay, is a sweet summer read that I really enjoyed. Full of shocking twists, tender heartaches, and a swoon-worthy romance, Mercy and Jaxon’s story is sure to captivate readers as it unfolds. Mercy is an absolutely amazing character, strong willed in nature and set on taking care of herself. As the story progresses and her bad experiences are offset by good, readers can’t help but root for Mercy, a heroine who’s circumstances continue to undermine her, both in wealth and health. She must deal with a lot, from a drug crazed mother to a health concern that will have readers biting their nails, but Mercy does not give up; the kindness of others keeps her going, and I admire her will to survive, even when survival seems dim at best. And Jaxon? Wow! He is a heartthrob, and I absolutely loved his adoration of Mercy. He is forced to make hard choices, many of which are selfless, and his persona was expertly crafted. I am sure that readers will love him just as much as I did, especially as we learn the lengths he’s willing to go to protect the people he loves. This novel is full of passion; passion for life, love, happiness… and while Mercy and Jaxon definitely have a bumpy ride along the way, I really enjoyed this sweet NA novel, and I think lovers of NA novels will definitely share the sentiment. Four lovely stars.